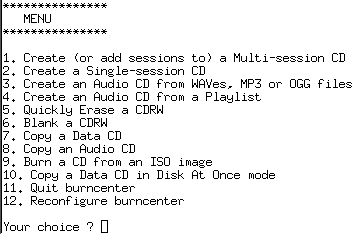 Burncenter is a very easy-to-use text-based interface to cd-burning tools under UNIX (cdrecord, cdda2wav, mkisofs). You can find more information in the README. Go download latest version. Feel free to use and redistribute it, since it is covered by the great GPL. to your /etc/apt/sources.list, then run apt-get update && apt-get install burncenter. If you have found a bug, or if you want to donate knowledge to this project, you are welcome to mail me. You can also see the Project page at freshmeat.